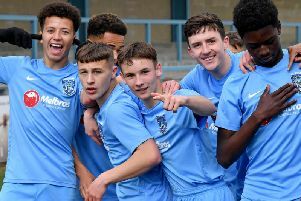 Rugby Town make a speedy return to Lincolnshire this weekend looking to end a run of three matches without a victory. Boston Town will host a Valley side that has seen their title aspirations wither away over recent weeks, with last Saturday’s 1-1 Sleaford scoreline coming on the back of a Butlin Road defeat to Eynesbury and a home draw against Pinchbeck. Rugby missed chances aplenty in suffering their latest disappointing outcome, and as a result lost further ground on the two teams above them - Deeping and Daventry, who both ground out single goal margin victories at the weekend. 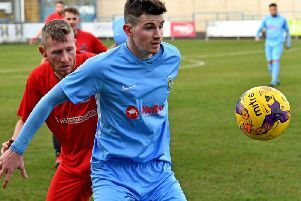 A stoppage-time strike got ten-man Deeping over the line against Cogenhoe, whilst a solitary Luke Emery goal at Daventry saw off Valley’s opponents this Saturday. Therefore Daventry maintained their nine-point advantage at the top of the UCL Premier Division table, with Rugby now four adrift of second placed Rangers. The league leaders sit things out this Saturday though, as both Valley and Deeping play their respective game in hands - with the latter visiting Leicester Nirvana. Even the most eternal optimist would struggle to put forward a case for Town overtaking a Daventry team that has now lost only one of their 33 UCL outings to-date, although there are arguably more straws for Deeping to clutch at when the Northamptonshire club’s run-in is scrutinised. Within their last five games of the campaign, Daventry are set to face the current 5th (Holbeach), 4th (Pinchbeck), 3rd and 2nd placed sides, whilst Deeping’s only remaining fixture against a top eight team comes in a season finale against Daventry at their Haydon Whitham Stadium. Rugby’s squad this weekend will be bolstered by the return of midfielder Dom Perkins, after the 24 year old completed his two match suspension at Sleaford. Town boss Carl Adams had opted for a change in goal at Eslaforde Park by installing Louis Connor in the number one shirt - meaning only a second missed game of the season for his regular keeper Matt Hill. However Connor missed out on a clean sheet after conceding a Sleaford equaliser midway through the second half - which cancelled out Simeon Tulloch’s fourth in a Rugby shirt, three of which have come in the last five games. Valley eased to a 5-2 victory over Boston in the reverse fixture between the two sides back in August - in what was the club’s first ever home game in this division. Danico Johnson grabbed himself a hat-trick in the Butlin Road summer sun that day, with Keenah Rosser and Charlie Evans also both on target. Following Saturday’s trip to the DWB Stadium, Town return to home action with the visit of current 6th placed Cogenhoe next Saturday (April 6). Their last four games then feature three more away days at Holbeach, Harborough and Daventry on the 13th, 22nd and 27th of that month respectively, with a final home match sandwiched in amongst these when they host Desborough on the 20th.